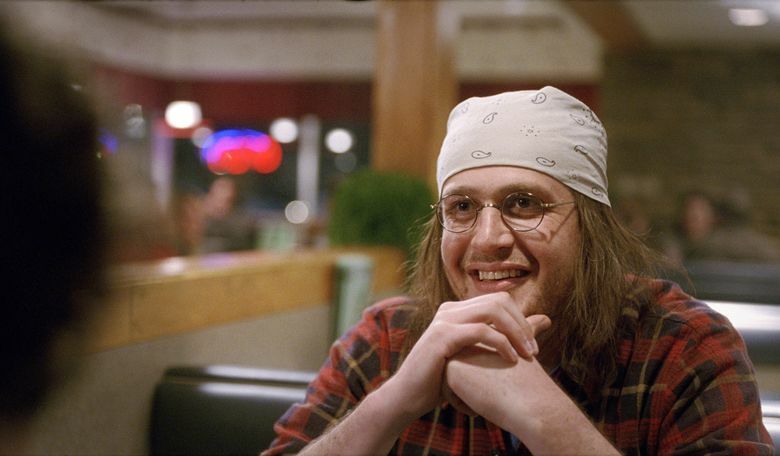 A review of “The End of the Tour,” which stars Jason Segel as the late author David Foster Wallace (“Infinite Jest”) in one long, enlightening conversation with Rolling Stone journalist David Lipsky (Jesse Eisenberg). Rating: 3.5 stars out of 4. Most of us, of course, can’t know how accurate Segel’s depiction is: Wallace, who died by suicide in 2008 (the movie begins with Lipsky hearing this news, then flashes to 12 years earlier), was famously private. A brilliant and wonderfully inventive writer in whose sentences you can get happily lost, he struggled throughout his life with depression. At the time in which the movie takes place, Wallace was living quietly in Bloomington, Ill.; teaching at the university nearby and living in a modest rambler with his beloved dogs. It’s this house at which Lipsky arrives early in the film, eager and nervous — everyone, in 1996, was reading, and talking about, this author. And what Segel does, from his opening minutes on screen to the movie’s end, is craft a portrait of what feels like an utterly real person, not an actor’s portrayal of one. You see Wallace tamping down his natural kindliness, not entirely successfully; he knows he and Lipsky aren’t meeting in a social situation, but he can’t help trying, tentatively, to make friends, reaching out little feelers of connection. He’s a quiet man who remains so even when angry; Segel’s pained, careful smile speaks loudly. Wallace is forever aware that he’s being observed, and while he’d like to control the process (“I don’t want to appear in Rolling Stone as someone who wants to be in Rolling Stone,” he says), he also can’t help just being himself: sad, funny, gentle, goofy, guarded, vulnerable, a little lost, astonishingly wise. ‘The End of the Tour,’ with Jesse Eisenberg, Jason Segel. Directed by James Ponsoldt, from a screenplay by Donald Margulies, based on the book “Although Of Course You End Up Becoming Yourself: A Road Trip With David Foster Wallace” by David Lipsky. 105 minutes. Rated R for language and some sexual references. Several theaters. In this two-man movie, smoothly directed by James Ponsoldt, Eisenberg is very good (any journalist will relate to the way he’s always checking whether his tape recorder is working, while trying to hide the fact that he’s doing it). But it’s Segel, and his soft, prairie-flat voice, that you’ll remember; thinking out loud, wandering with words, pulling us in.